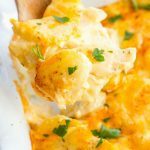 Cheesy Scalloped Potatoes and Ham is an easy leftover ham and potato casserole that’s smothered in a creamy homemade cheese sauce. 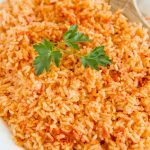 It can easily be served as a side dish or as the main event. We make a ham just once of twice or year but I kind of wish we would do it more often. We love to use leftover ham to our Ham & Cheese Biscuits or One Pan Ham & Cheese Tortellini. If you have leftover ham after Easter like we always do, then this recipe is for you! Or maybe you just like ham. And cheese. And potatoes. 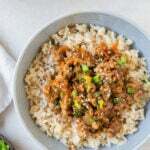 Then this recipe is for you too. 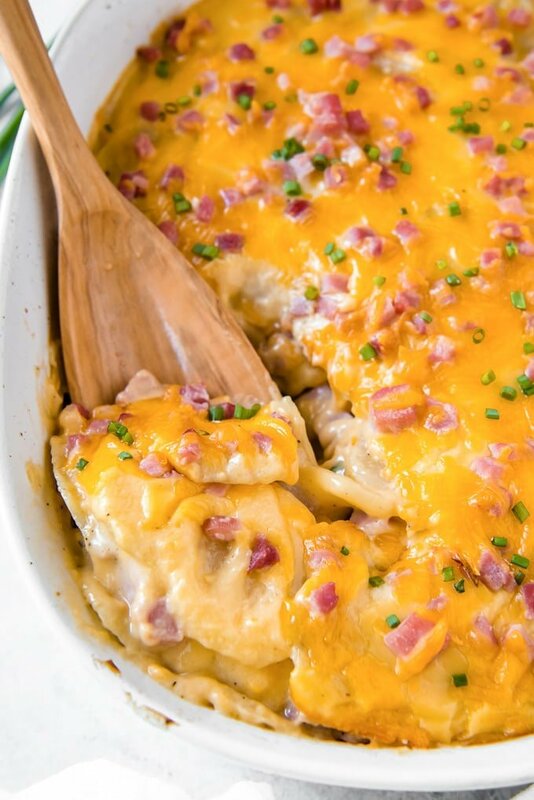 Cheesy Scalloped Potatoes and Ham is an easy casserole made with a homemade cheddar cheese sauce and baked to creamy, bubbly perfection. It’s my grandma’s recipe cheesy potatoes recipe and we’ve been making it in our family for longer than I’ve been alive. What’s the difference between AU GRATIN POTATOES and SCALLOPED POTATOES? For me, this is a bit of a technicality. 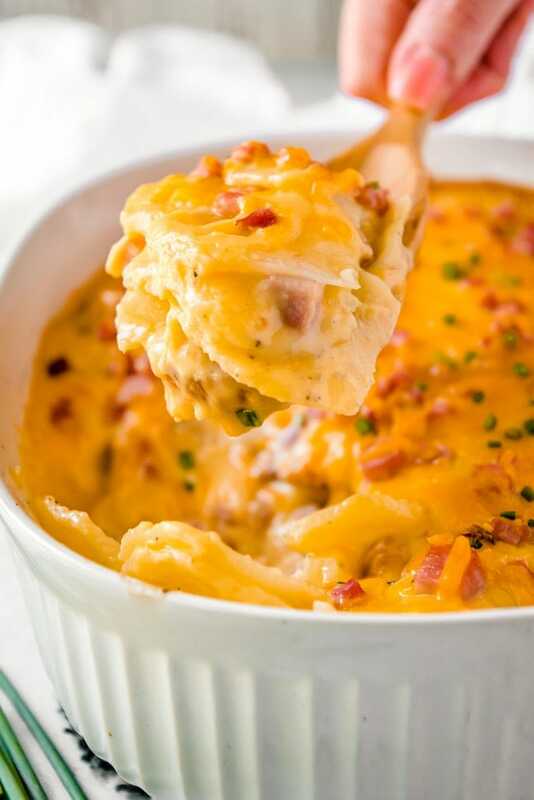 Scalloped Potatoes are made with a creamy sauce while au gratin potatoes are covered with cheese. 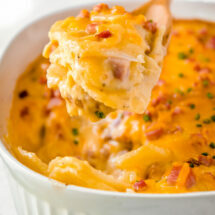 However, since we kind of combine these two methods, I feel confident calling the Cheesy Scalloped Potatoes. Plus, that’s what Grandma always called them, and we don’t mess with Grandma! 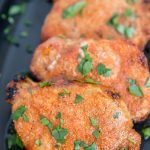 I love this recipe because it’s so easy and tastes incredibly rich and creamy and salty – better than any cheesy potato casserole I’ve ever had. 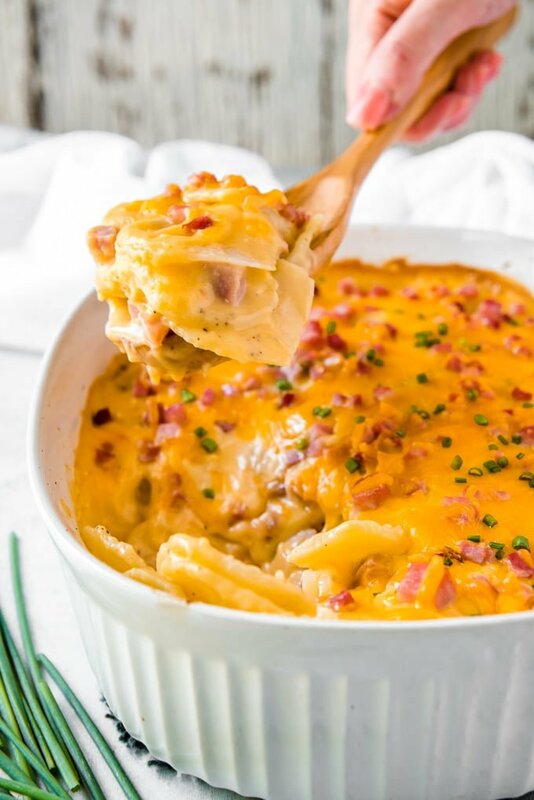 Ham and cheese is undeniably one of the most perfect combinations and they fit together so well in this casserole That could be due to the massive amounts of fresh Cheddar cheese in the rich, creamy sauce, but who knows? 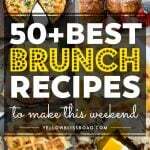 Most potato casserole recipes I’ve seen (au gratin or scalloped) use raw potatoes and bake the casserole for over an hour, up to an hour and a half or more! The potatoes take quite a while to cook so that lengthy time was necessary. But my grandma boiled the potatoes whole and unpeeled first, for about 25 minutes, to cook them most of the way through. Then she would peel them when they were cool enough to handle and slice them with a paring knife. this got the job done i half the time, and we like that. While the potatoes are boiling, the cheese sauce is made. The cheddar cheese sauce is a basic bechamel sauce with grated cheddar added. A bechamel starts with a roux (melted butter and flour, cooked until golden) then milk is added and simmered until nice and thick. Finally shredded cheese is stirred in until it’s melted. I sometimes add a bit of seasoning, like garlic, paprika or ground mustard to compliment the cheese, but that’s a personal preference. Finally the potatoes, ham and cheese sauce are layered in a large casserole dish and topped with more grated cheddar and some ground Hungarian paprika for color. I like to add fresh minced chives or parsley as well, but none of the garnishes are necessary. WHY DO YOU BOIL THE POTATOES FIRST? The par-boiling of the potatoes ensures that the potatoes will be creamy and soft and cooked all the way through in under 30 minutes of baking time. Most casseroles that start with raw sliced potatoes always have comments stating that the potatoes are unevenly cooked. You won’t have that problem with my Grandma’s Cheesy Scalloped Potatoes and Ham! 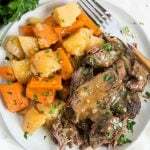 Russet potatoes or Yukon Golds will work best for this recipe. Both will hold their shape well during and will be easy to slice. CAN YOU FREEZE CHEESY SCALLOPED POTATOES? You can! Cool the potatoes completely and place in an airtight container. You could also freeze them in the pan, then pop them out and wrap them in foil. To reheat, thaw in the fridge overnight. Place into the baking dish and cover with foil to keep them from drying out. Bake as the recipe directs. These potatoes will last several days in an airtight container in the fridge. 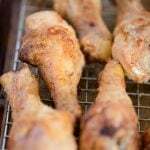 You can reheat a large portion in the oven, or use a microwave for individual portions. 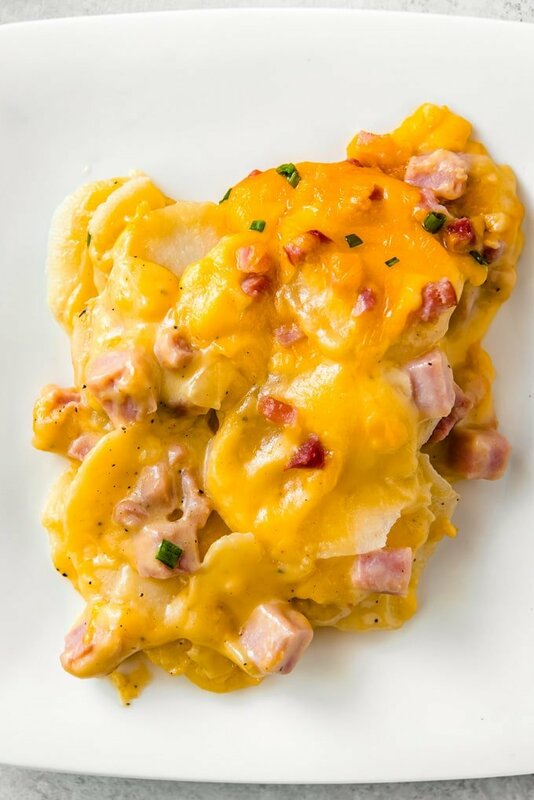 Cheesy Scalloped Potatoes and Ham is an easy leftover ham and potato casserole that's smothered in a homemade cheese sauce. Serve as a side dish or entree. Preheat oven to 350 degree F and grease a 13"x9" baking pan with cooking spray. Bring a large pot of water to a boil. Scrub potatoes and place them, whole, into the boiling water. Cook for about 20 minutes. Remove from the water and let sit until cool enough to handle. Meanwhile, make the cheese sauce. Melt butter in a medium saucepan over medium heat. Whisk in flour and cook, whisking constantly, until flour is golden brown; about 2 minutes. Stir in milk and cook, stirring often, until thickened; about 2-3 minutes. Remove from heat and stir in shredded cheese. Season with salt and pepper. If the sauce seems too thick, you can stir in up to 1/4 of a cup of milk. Gently peel potatoes and slice into 1/8 inch rounds. Place 1/3 of the potatoes overlapping in a single layer in the baking dish, seasoning with salt and pepper. Top with about half of the ham. Spoon about 1/3 of the cheese sauce on top of the potatoes and ham. 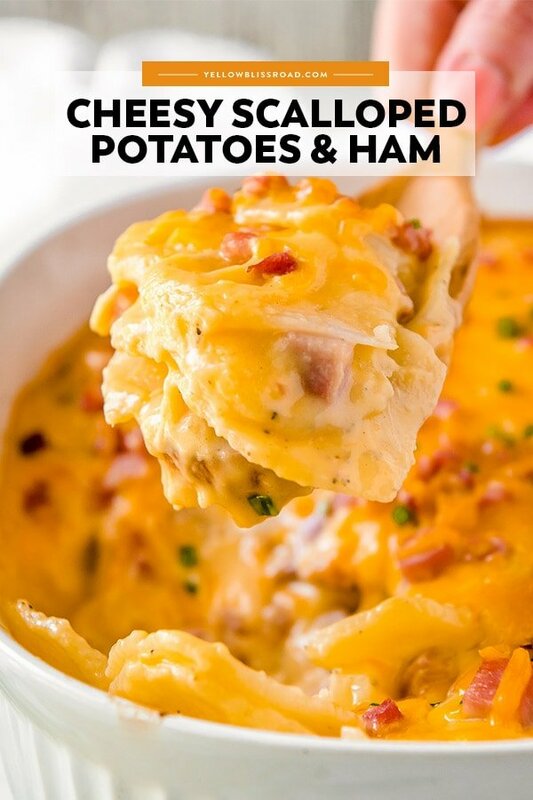 Repeat with another layer of potatoes, ham and cheese sauce, then finish with a final layer of potatoes and pour all of the remaining cheese sauce over the top layer of potatoes. Spread to ensure all of the potatoes are covered. Sprinkle with 1/4 cup shredded cheddar (if desired) and paprika (about 1/8-1/4 teaspoon). 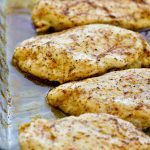 Bake in the 350 degree oven for 20-25 minutes, or until sauce is bubbly. Garnish with fresh minced chives and serve immediately. Nutritional information is based on 6 large main course servings. If you plan to serve as a side dish, you could easily get 8-10 servings.